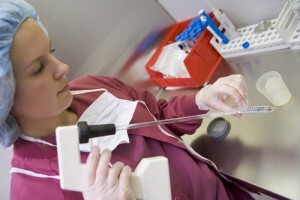 A new study on the impact of Cystic Fibrosis carrier status in in vitro fertilization (IVF) procedures and outcomes, entitled “Female cystic fibrosis mutation carriers and assisted reproductive technology: Does carrier status affect reproductive outcomes?“ was recently announced by Celmatix, a New York City-based company that is developing products that help to personalize the treatment for infertility and fertility. This study was published in the journal Fertility and Sterility by Teresa A. VanWort, from the group of Dr. Alan B. Copperman, at Reproductive Medicine Associates of New York, which is a national and international leader in state-of-the-art, compassionate reproductive medicine. Cystic fibrosis (CF) is a genetic disease that affects various organs and is characterized by mutations in the cystic fibrosis transmembrane conductance regulator (CFTR) protein. The mutations of the CFTR protein in male carriers have been linked to infertility, but the potential negative effects on the ovarian and reproductive functions of female carriers have never been addressed. The research team addressed a potential correlation between female cystic fibrosis (CF) carrier status and in vitro fertilization (IVF) responses and outcomes. This was a retrospective cohort study that analyzed females under 40 years old, screened for CFTR mutations, and that received IVF treatment between July 2002 and March 2013. The patients were submitted to controlled ovarian hyperstimulation with regular monitoring, retrieval of vaginal oocyte, fertilization, embryo transfer, and a pregnancy test. The researchers evaluated several procedures of IVF stimulation response and cycle outcome in both CF carriers and non-carriers. In this study, the authors concluded that there were no significant differences in stimulation response and cycle outcome between female CFTR mutation carriers and non-carriers. “We are committed to uncovering how a woman’s unique DNA signature impacts her fertility in order to help patients and doctors make better treatment decisions,” said Dr. Piraye Yurttas Beim, Founder and CEO, of Celmatix, in a press release. “Research like this moves us one step closer to that vision of leveraging personalized data for improving fertility planning and outcomes,” added Dr. Piraye Yurttas Beim. “Our team is encouraged by these findings and can now reassure female CF mutation carriers that their carrier status is unlikely to affect their chances of getting pregnant with IVF,” said Dr. Alan B. Copperman, a Founding Partner of Reproductive Medicine Associates of New York. “Further research is needed to determine whether the subtle differences noted among carriers of specific CF mutation loci are clinically relevant and whether CF mutation carrier status in females may impact reproductive outcomes outside the context of assisted reproductive technologies (ART),” concluded Dr. Copperman. Tagged in vitro fertilization, IVF.